To learn more call 513-528-5674, email sales@LNSamerica.com, or visit www.LNS-america.com Bar Feeding Systems Work Holding Systems Coolant Management Systems Chip Management Systems Air Filtration Systems RELIABLY LOADING BAR STOCK WITH DIAMETERS AS SMALL AS 0.8 MM JUST GOT FASTER & EASIER The NEW GT 112-E automatic magazine bar feeder takes the worry out of running small diameter bar stock unattended on sliding headstock machines. This affordable and compact bar feeder flawlessly loads bars with diameters from 0.8 mm to 11 mm (12.7 mm with bar preparation). 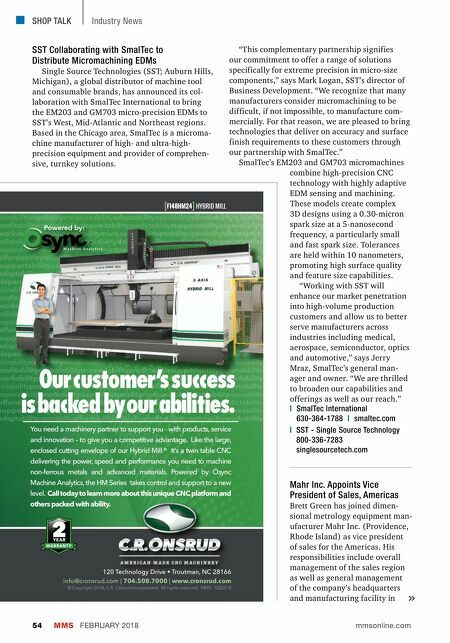 Available in two versions for 12'-2" or 6'-6" long bars, GT 112-E has a unique dual, 2-diameter U-shaped guiding channel system with a patented sectional cover that, combined with a self-centering bar clamping system, matches the entire diameter range of the lathe. And there's much more: • 2-minute or less partial changeovers • Single pitch screw magazine keeps very small bars separated for consistent and reliable bar loading • Bar storage platform for easy bar separation and loading assistance • Electro-mechanical headstock synchronization • LNS safety joint pipe completely contains the bar inside the headstock – no need for spindle liners • High capacity magazine tray holds up to 30 bars with 7 mm diameter and under, and 15 bars over 7 mm • Hand-held remote HMI with touch screen technology • Easy maintenance access with optional 400 mm Z-axis bar feeder retraction system Buying a new turning machine? 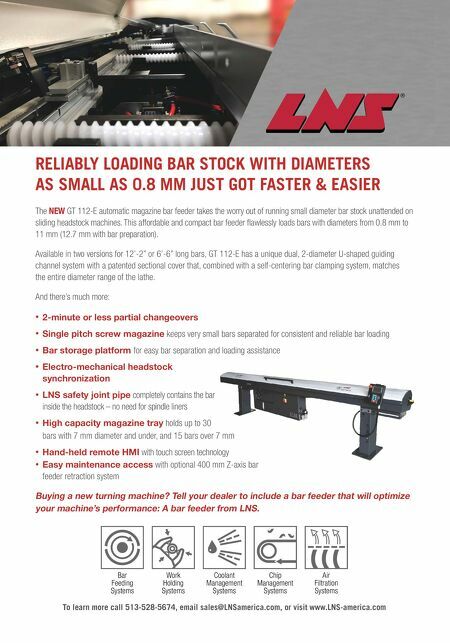 Tell your dealer to include a bar feeder that will optimize your machine's performance: A bar feeder from LNS.